This series of articles began with the Craxford family who originated in Gretton, Northamptonshire and traced the life of Robert Craxford and the circumstances which led him to become a fellmonger in the neighbouring country of Rutland. In the early 1820s, whilst still living in the hamlet of Laxton, Northamptonshire, he met Harriett Cotterill, a girl from Barrowden, Rutland. They married in the Baptist Chapel in her home village on December 13th 1823 but returned to Laxton to begin their married life. By dates, Harriett was about six months pregnant and she duly gave birth to a daughter, Sarah, who was baptised in Barrowden on March 14th 1824. Within the next year or so, Robert had moved his family over the border to take up residence in Barrowden. Sarah was the eldest of Robert and Harriett's seven children (the lives of Sarah's siblings are described in the article From Gretton to Barrowden 2: From Craxford to Wainwright and beyond). Little is known of her early life. She has not been found in the England censuses of either 1841 or 1851. However it is reasonable to assume that she spent some time in domestic service as did her younger sister, Mary, who was born in 1826. By 1851, she had met Charles Matkin who she married at the Barrowden Baptist Chapel on December 18th 1851. Her father and her sister Lucy acted as witnesses. Charles Matkin was born in Lincoln on May 26th 1817, the eldest son and third known child of Joseph Matkin and Mary Palmer. 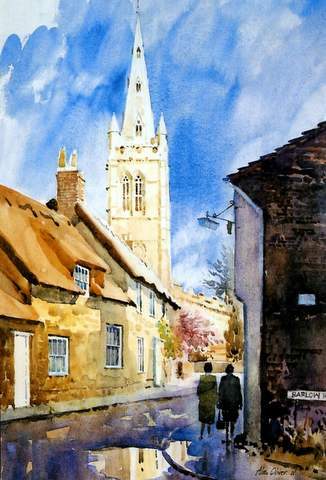 For many years, the family had lived in Grantham Lane where his father had been a painter. In December 1847 he inherited real estate and land when his cousin farmer William Ellis died earlier that year. At the time of his death in 1850, Joseph owned ten cottages (one freehold, the rest copyhold) and some land in Nettleham, a village a few miles north east of the town. These were put up for sale by auction (1) at the Plough Inn Nettleham in November that year. Charles and his younger brother Joseph (born 1823) both took up the trade as compositors and printers. Joseph worked for many years in this capacity with the Stamford Mercury newspaper (2). By 1851 Charles had moved to Uppingham, Rutland where he was lodging in the High Street with widow Christiana Swann, the proprietor of a boarding house. It was during this time that he met and married Sarah Craxford. They continued living in the town after the ceremony and their first three sons were born there. 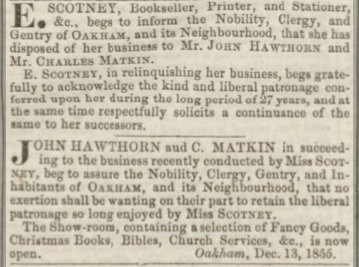 In 1855 in association with John Hawthorn they entered into negotiations with Miss E Scotney to purchase the Bookseller, Printer and Stationery business she had run in the High Street Oakham for 27 years. The deal was completed on December 15th 1855 (3). 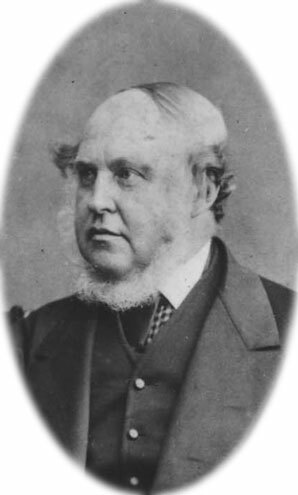 John Hawthorn, born in Stafford in 1828, was the son of Maria Hawthorn and had recently set up as a bookseller in Uppingham. His mother had been a widow for many years and was a woman of independent means having had run a chain of boarding houses in Stafford with her sister Ann Dickerson. John remained in Uppingham with his mother while Charles moved the six miles north to the property in Oakham. The following year, Sarah became pregnant again and in February 1857 she gave birth to another son. The boy was baptised George but sadly the infant died on November 2nd 1857. He had contracted croup (whooping cough) which had killed him within three days. Within a few months, Sarah was expecting for the fifth time and she gave birth to another son in the autumn. There is little documentary evidence to show that Charles kept in regular contact with his own family even though his brother Joseph lived only 11 miles away in Stamford. Joseph had married Susannah Wallis in Hull in 1852. 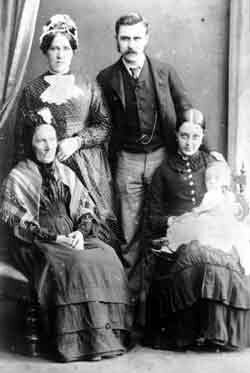 The two families did get together on November 21st 1858 to celebrate an occasion in Oakham when Charles and Sarah's new arrival was baptised Frederick George in the same ceremony as Joseph and Susannah's four year old daughter Susannah. The arrangement with John Hawthorn lasted for seven years. For a time they operated similar establishments on the two towns' High Streets. Then on November 7th 1862, the partnership was dissolved. Charles and John went their separate ways; Charles taking sole control of the Oakham business with John operating his business in Uppingham. In a newspaper later the same month, Charles advertised 'a choice selection of Fancy Goods from London adapted for Christmas and New Year gifts'. He noted that the business received parcels of new goods from London twice a week. Playing cards of various designs were available at one shilling a pack. The premises were not immune from shoplifting. In 1863 a local tailor was committed for trial having received goods (a leather purse, a mother of pearl paper knife and a bone paper knife) stolen by a ten year old boy. By June 1865 Charles had opened a new office on the High Street to accept general printing items, handbills, posters and business cards. Charles' health began to fail as he reached his fifties. He suffered increasingly from heart problems which encroached on his daily activities. He had seen son Joseph leave home to join the Merchant Marine and his son William join the Army. He died suddenly, presumably from a coronary thrombosis, on December 16th 1874. His death was recorded by family friend and Registrar for Oakham District, Thomas Swift. After Charles' death, Sarah continued to live on the premises and manage the family business. She did advertise for a housekeeper in the local press in April 1886. She finally retired from active participation towards the end of the century. She died at home on June 12th 1903 aged 79 years, the cause of death registered as asthma and senile decay. She was buried alongside her husband in the graveyard behind All Saint's Church. Charles was the eldest son of Charles and Sarah Matkin, born on November 5th while the family were still living in Uppingham. In his teenage years he moved to Bedfordshire where he undertook an apprenticeship to a printer in Woburn. By the time of the census of 1871 he was lodging with the family of printer John Walker in Costin Street Bedford. It was in the town that he met his future bride, Harriet, the daughter of Horatio Green. They became engaged and in July 1873 they put their names forward for consideration to be awarded a Marriage Portion (valued at £ 20). This was a charitable event, held four times a year, where trustees of the estate of Sir William Harpur would allot by ballot a portion of moneys available from the profits of the trust 'to poor maidens resident in the town' towards their marriage expenses. The award they entered was the last to be held and it is not known whether they were successful. (4) They were married in Bedford towards the end of the year. Their daughter, Maud Ellen, was born in 1874. After his father's death, Charles returned to Oakham taking his new wife and baby daughter with him to help with the running of the family business. They bought a house in Northgate Street whose garden adjoined the schoolyard of the National School and which was a hundred yards or so from the shop. 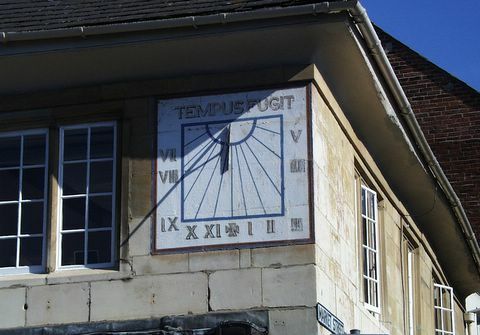 In the latter part of the century, Charles had a sun dial installed under the roof line on the face of the building on the corner of Market Street and High Street which has become a popular landmark in the town. Charles was involved in an array of civic functions. For nearly thirty years he was a Knight of the Oakham branch of the Primrose League, an organisation dedicated to the spreading of Conservative values across the country. He was honorary secretary of the organising committee for the Dog Show at the Rutland Horticultural Society Annual Show. In 1899 he served on the Grand Jury at the Rutland Quarter Sessions. The business attracted some transatlantic attention in 1899 when the American technical journal The Inland Printer (published in Chicago and New York) contained the following passage "From Oakham, the county town of the smallest county in England (Rutland), Mr Charles Matkin forwards a package of high-class printing that might well have been sent out from the greatest metropolis. He uses American presses in his work, and is well satisfied with their product. Composition, press work, and harmony in colouring are of a high grade of artistic workmanship that is rarely surpassed and not often equalled". (5). For many years, Charles was responsible for the content of a regular column entitled 'Oakham and Uppingham Journal' which appeared in the Grantham Journal newspaper. From 1892 to 1941, the business published Matkin's Oakham Almanac annually. Over the next twenty years, Harriet had another nine children, seven girls and two boys. Sadly their first, Maud Ellen, died on May 26th 1883 aged just nine years, having suffered from rheumatic fever for three months. Second born daughter Mary (born 1876) married Herbert Bex, who managed a mineral water company, in the winter of 1900. They moved to Peterborough. At the time of the census of 1901, daughters Ethel (born 1877) and Sybil (born 1884) were living with their grandmother, employed as stationery shop assistants. At the beginning of the new century, Charles moved the family into the Manor House at No. 1 Northgate Street which was adjacent to All Saints Church. This 17th century thatched cottage originally belonged to the Dean and Chapter of Westminster Abbey who held the title of Lord of Deanshold in Oakham. The property is now a Grade II listed building. Ethel was the next of the daughters to marry. She tied the knot with farm worker John Thomas Bromhead from the nearby village of Burley on July 27th 1905. Her five younger sisters acted as bridesmaids. Later that decade, Charles and Harriet were able to celebrate three marriages in quick succession. In the summer of 1909, daughter Constance (born 1888) married assistant chemist Robert Whittle and moved into a house in South Street. Then within weeks, daughter Dora (born 1879) married tailor and outfitter Herbert Arthur Spite and returned with him to his home town of Sleaford, Lincolnshire. The following year in the spring of 1910, daughter Annie (born 1886) married journalist James Herbert Freeman, settling in Northampton. 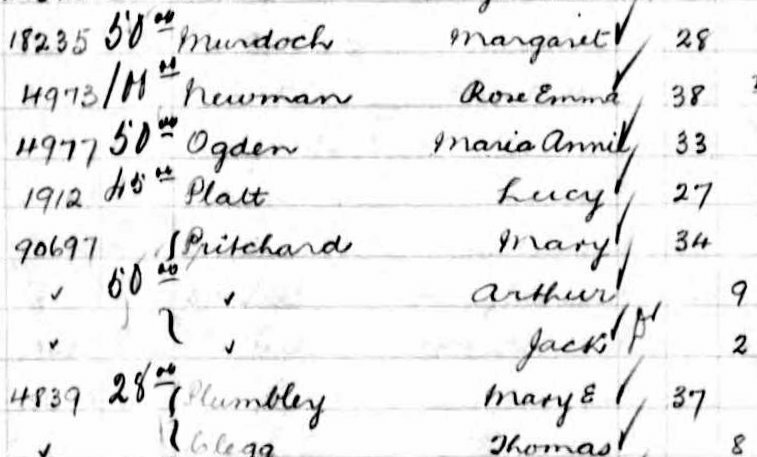 By the time of the 1911 census, four of their children: Lucy (born 1882), Sybil, Charles (born 1890) and Philip (born 1895) remained at home with Charles and Sarah. The youngest three were all employed in the business. Charles junior did indeed continue to operate the printing business after his father's death, maintaining the publication of the annual Almanac into the Second World War. He served as a counsellor on the local coucil. For several years he was one of the originators and then served on the organising committee of the Oakham 'Rag', an annual event which raised funds in support of the Leicester Royal Infirmary. In September 1932 he was elected as a Life Governor of the Infirmary. 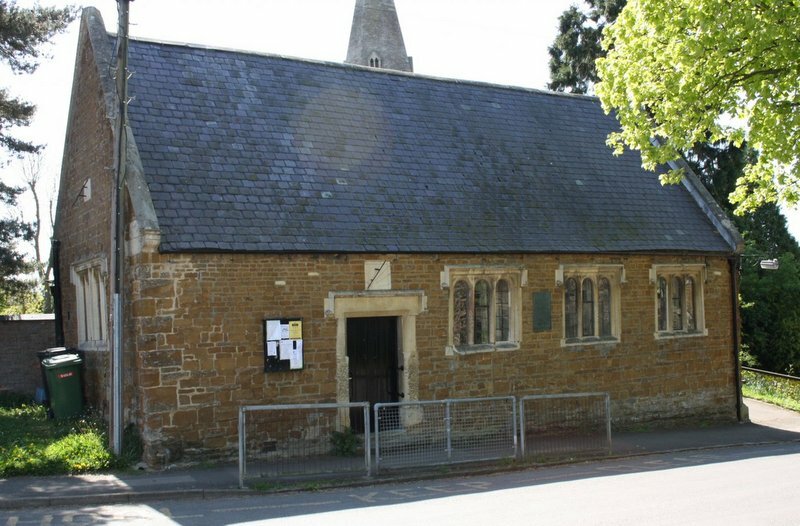 He was also involved in local charitable appeals which included raising funds in 1937 to install a wireless system into the wards of the Oakham Poor Law Hospital. He did require domestic help in his personal life, advertising for a full time gardener and handiman in December 1938. He allowed the shop to be used as a recruiting station at the outbreak of the second world war. He was a captain of the Auxilliary Fire Brigade in the 1930s and joined the National Fire Service as a company officer in the war years. He was awarded the British Empire Medal in the New Year List 1943. Charles continued to live in the town. He died on April 15th 1971. 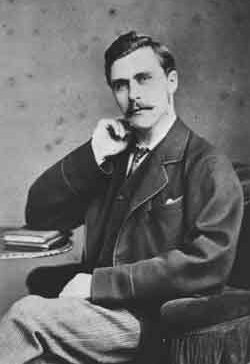 Joseph Matkin, born on December 2nd 1852 in Uppingham, Rutland was the second son of Charles Matkin and Sarah Craxford. By the age of six years he had been enrolled as a pupil at Oakham School. There is evidence however that he was an unruly child and difficult to discipline. 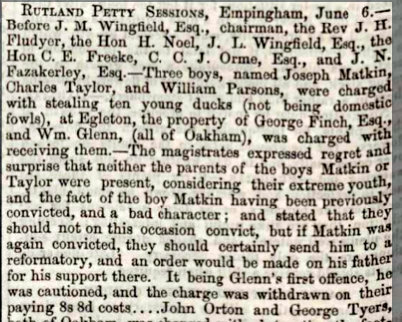 At the age of twelve he was apprehended with two other boys stealing ten ducks from a breeder in Egleton, a small hamlet a couple of miles south east of Oakham. He was brought before the magistrates at the Rutland Petty Sessions at Empingham on June 6th 1864 (9) along with the adult who had received the fowl. The bench noted the fact that Joseph had received a previous conviction and had a bad character. They also expressed regret that his parents had not attended the Court. An order was made instructing his father to provide proper support for his son. Joseph was warned that if he was convicted again, he would be sent to a reformatory. His father did make a rebuttal to the charge a few days later, sending a letter to the newspaper detailing the alternative course of events (10). It was shortly after this event, however, that Joseph was sent away to board at Billesdon Parish Free School. Billesdon is a village in Leicestershire, midway between Leicester and Oakham. The school was founded in 1650 by William Sharpe and had been renovated in 1856. In Joseph's time it catered for an average of 50 pupils and at a cost of between seven shillings and sixpence and ten shillings a year (11). Just short of his seventeenth birthday, Joseph enlisted in the Royal Navy. His first assignment in August 1870 was to the ironclad battleship HMS Invincible. After twelve months he was transferred to the sister ship HMS Audacious as the ship's steward's boy. In both cases, these ships were assigned as guard ships to the port of Hull. It has been asked elsewhere what would attract a young, sensitive, educated lad from the Midlands, with no maritime background in his family, to embark on a career or just a cruise, in the Royal Navy? This is not correct for Joseph would have been well aware that two of his uncles had embarked on a career at sea. Indeed during his formative years, his uncle, William Craxford, served as a Royal Marine and spent a five year tour of duty on a survey expedition of the coast of British Columbia, Canada (This is recounted in the section The Marine and Railwayman of the article From Gretton to Barrowden 2). It was in November 1872 when Joseph was transferred to another ship and became part of a historic undertaking. Much has been written about the Challenger Expedition and only a brief outline will be given here. The expedition was a joint venture between the British Admiralty and the Royal Society, led by Charles Wyville Thomson and William Carpenter. It was charged with investigating the physical conditions of the deep sea (depth, temperature etc); determining the chemical composition, organic matter and particles of sea water from the surface to the bottom; asceratin the physical and chemical nature of deep sea deposits; to investigate organic life at different depths and on the sea floor. Its four year voyage covered nearly 69,000 miles passing south through the Atlantic via the Caribbean and South Africa, skirting Antarctica, traversing the Pacific to Hawaii and the Far East and back home again via the Atlantic. 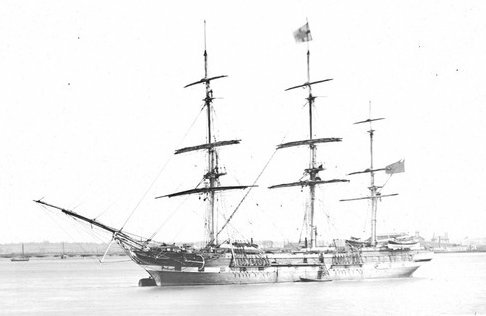 The vessel, a 200 foot long, 40 foot wide, 2300 ton three-masted wooden corvette with an auxiliary coal fired engine, was built at Woolwich in 1858. 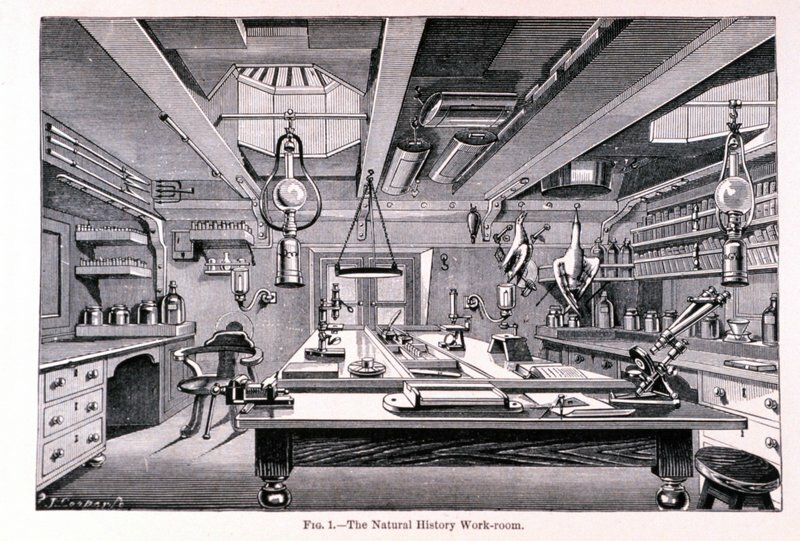 In the early months of 1872 it underwent a significant refit as a scientific research vessel to support laboratory space, equipment and stores. It was destined to house a complement of 23 officers, 240 ratings and able seamen and six scientists in very cramped conditions. During the course of the journey a quarter of the crew was to desert. The scientific experiments included taking depth sounding using extremely long lengths of weighted hawser (the ship carried 70 miles of rope) at regular intervals, temperature measurements and dredging specimens from the ocean floor. Specimens including over 4500 previously unknown species were examined and collated in the laboratories. At the end of the journey the scientists prepared a formal 50 volume report of the expedition and their findings. Their discoveries paved the way for the sciences of oceanography and marine geology. Several of the scientists and officers also wrote their own memoires or kept diaries. Joseph maintained the position he had from HMS Audacious as ship's steward's boy. 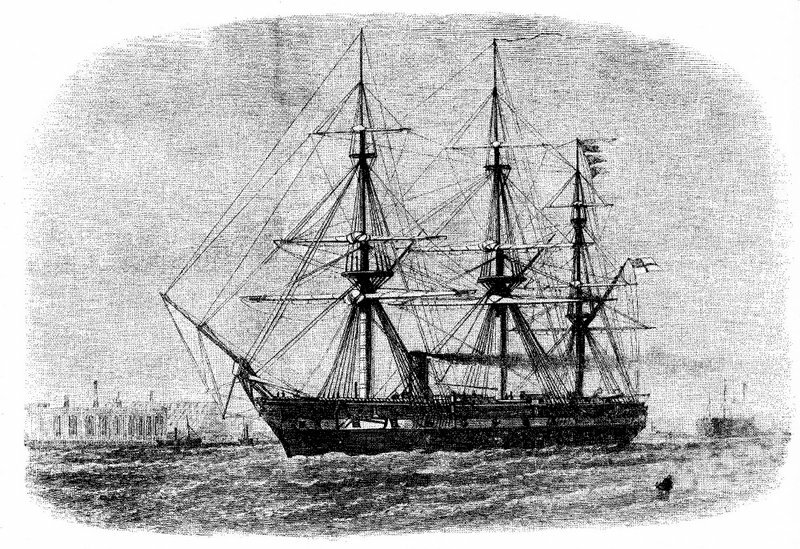 The Challenger set sail from London on December 21st 1872 (just after his nineteenth birthday) and would not return to England until May 1876. Most of his time was spent in the lowermost deck in the tiny Steward's Issuing Room and he would not have expected much interaction with the officers or scientific staff. When illness affected the Steward, Joseph was promoted to Ship's Steward's Assistant. He was on board ship in Tokyo Bay when he heard of the death of his father, which had occurred four months previously. Alone among the crew of the lower decks, Joseph kept his own journal and wrote 69 detailed letters home. The evidence suggests that he kept in contact predominantly with his Craxford side of the family writing to his cousins in Barrowden and Aunt Lizzie (Elizabeth Craxford Goodman) in Swadlincote as well as his immediate family in Oakham. 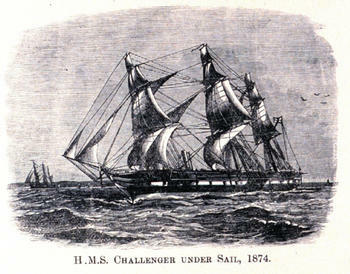 The Challenger docked at Sheerness on May 27th 1876. The next two weeks were taken up unloading cargoes, returning stores and general cleaning of the ship. Joseph was finally paid off from the expedition on June 12th 1876. He had also decided to take his discharge from the Royal Navy the same day. Within months he had obtained employment as a Government clerk. He renewed contact with his family in Oakham and also renewed his acquaintanceship with Mary, the daughter of Thomas Swift, who had registered the death of his father six years before. At the turn of the decade Joseph listed his residence as St Saviour's. Pimlico. St Saviour's Church which had been built in the middle of the 1860s stands at the north end of St George's Square, London. In March 1894, Joseph resigned his position, taking his Civil Service pension. The family returned to Oakham, finding a house just inside in Penn Street, a quiet narrow street on the southern edge of the town which ran from South Backway (now called South Street). Its western aspect was open to fields. 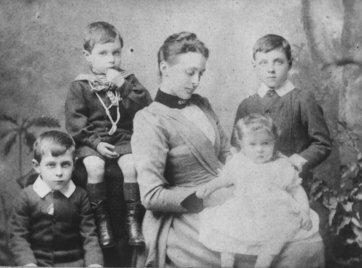 Mary became pregnant again that summer and gave birth to their sixth son, Joseph Hugh, on February 24th 1895. It does appear that he maintained his outside interests in retirement, including horse racing and gambling. In late June 1895 he was travelling back from a race meeting at Ascot on a train when he became involved in a game of nap with other passengers. When he lost money (an £ 8 bet) he believed unfairly he had them arrested for theft. The case went to Court but was discharged. It left to a wry comment in the Occasional Notes column of the Pall Mall Gazette (an evening newspaper which was absorbed into the Evening Standard in the 1920s) (15, 16). 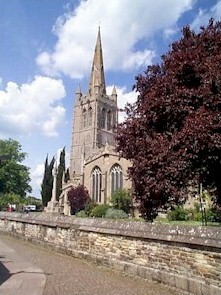 The family appeared settled in Oakham until shortly before the first World War. In 1913, Joseph decided to return to London. During the war years, he and Mary separated; she going to live with her son in Bedford. For some time, Joseph lived in Engell Street off Long Acre in London. He had a brush with the law when he was caught travelling on a train without a ticket in January 1921. He received a small fine (17). In the 1920s, Mary spent a year visiting Canada. Joseph died on October 27th 1927, The circumstances of his death are somewhat confused. By this time he was living in an apartment at 6 Old Compton Street, Holborn. Family lore believes that he sustained severe injuries in a collision with a motorcyclist in a road traffic accident. The available evidence tends to deny this. Records confirm that he was admitted to the in patient ward of St Pancras Workhouse from the St Pancras Hospital on September 16th 1927. An inquest was convened on October 31st 1927 by F Danford Thomas, the deputy coroner for London. After evidence had been presented a verdict of 'Coma, Pneumonia, Meningitis, Dementia induced by injury to the forehead from accidental fall in the street.' The logical assumption is that Joseph banged his head and rendered himself unconscious from a trip in the street about six weeks prior to his death. It is possible that the meningitis developed from a fracture of the skull. Presumably he did not recover consciousness prior to his death. The other diagnosis of interest is the statement that he had dementia. This would have been a longer term condition and there may have been evidence given at the inquest which supported this assertion. The London Metropolitan Archives have advised that only ten percent of inquest records from the period survive and unfortunately Joseph's is not amongst them (18). Mary made her home at 13 Bradgate Road, Bedford. She became a member of the Russell Park Baptist Church in the town. Her son Joseph William continued to live with her until her death on October 28th 1939. She was nearing her 81st birthday when she died and left thirteen grandchildren. A private service was held for her at her home followed by a cremation ceremony at Golders Green Crematorium, London. The next section gives a brief overview of the lives of the six sons of Joseph Matkin and Mary Swift. Much of the twentieth century detail is sketchy through lack of full documentary record. Particularly notable is the final resting places of two of those sons and their remarkable proximity to the haunt of one of the previous generation. Joseph and Mary's eldest son, Charles, was born in the summer of 1881 shortly after the couple had moved to Romford, Essex. He does appear to have been scolastically bright and he passed the open competitive examination for boy clerks for the Civil Service in June 1897. Within four years he had obtained a post as a clerk for the London County Council. He moved to Hornsey in North London. Initially he boarded at 9 Ribblesdale Road, the home of Accountant's Clerk Edwin Cantrill and his family. By the time of the census of 1911 he had become a Municipal Officer for the Council and had moved on to 21 Bryanstone Road, Crouch End where he was lodging with Elizabeth Cole and her family. At the outbreak of the war, Charles was living in New Barnet. He married Irene Grace Crebbin, the 23 year old daughter of distiller James Charles Crebbin at Holy Trinity Church on July 5th 1915. His younger brother, Robert Swift Matkin, was in attendance. The couple stayed at Beaufort Lodge on Somerset Road for the ceremony. They were to have two daughters: Lorna, born in the early spring of 1918; Phyllis, born in the spring of 1921. They made their family home (which they named Kenilworth) in Lansdown Avenue where they stayed for many years. Lorna became a nursery school teacher in Luton. She was lucky to escape with minor scrapes when she was thrown out of a car which overturned in a road traffic accident in July 1939. Charles ultimately became a Departmental Principal at the Public Control Office of London Council. After the second world war, Charles and Irene retired to Lavenham, a village in rural Suffolk. They named their house Wayland. Irene died there on February 5th 1956. She suffered a heart attack. Charles lived on into his eighty second year, dying in the summer of 1965. Joseph and Mary's second son, Joseph William, was born on June 20th 1883 while the family were still living in Romford. After spending the first part of his teenage years in the 1890s in Croydon, he moved to the family home in Penn Street Oakham where he became a Post Office Clerk and telegraphist. He returned to Romford where he married Katie Ellingworth on August 15th 1914 at the Salem Chapel on London Road. The ceremony was witnessed by his mother and brother Charles and by her father and sister Hilda. The union of this couple was a close knit family affair. Katie was the eldest daughter of David Ellingworth, a farmer in Romford. His sister, Clara, had married Thomas, the son of Thomas Swift who was Mary Swift's (Joseph's mother) brother. Thomas and Clara had been staying with David's family on the farm in 1891 and Katie had been staying with Thomas and Clara in their home in Wandsworth in 1901. What's more, David and Clara's father, James, had been born in the same village, Ketton in Rutland, as the elder Thomas Swift. Ellingworth is not an uncommon name in the country. In 1911, an Arthur Ellingworth, painter and decorator, lived just nine doors away from Joseph and Mary Matkin in Penn Street and Henry Ellingworth was a music seller and photographer with premises in Melton Road. Neither were immediately related to each other and were not a directly connected to the Matkins within three generations. Frederick George Matkin was born on July 3rd 1886 shortly after the family had moved to Saxon Road in Croydon, Surrey. He attended Sydenham Road Junior School in the town until the family moved back to Oakham in March 1894. By the turn of the century he was working as a junior clerk in the County Court office. At the age of twenty years, Frederick made the decision to emigrate. 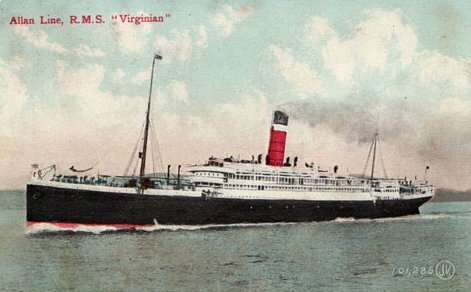 On June 31st 1907, he boarded RMS Virginian at Liverpool bound for Montreal. Although he made his home in Canada he made repeated trips across the Atlantic in the years to come. From Montreal he moved to Morse, a town in southern Saskatchewan where he started working as an accountant for a bank. He was to marry Lucy Ellen Platt, a girl from Congleton, Cheshire. 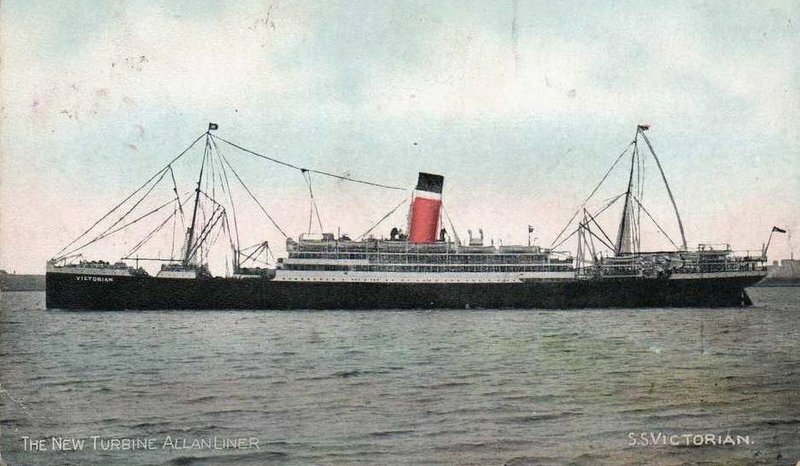 Lucy embarked on RMS Victorian in Liverpool in July 1914 to make the crossing to Canada. 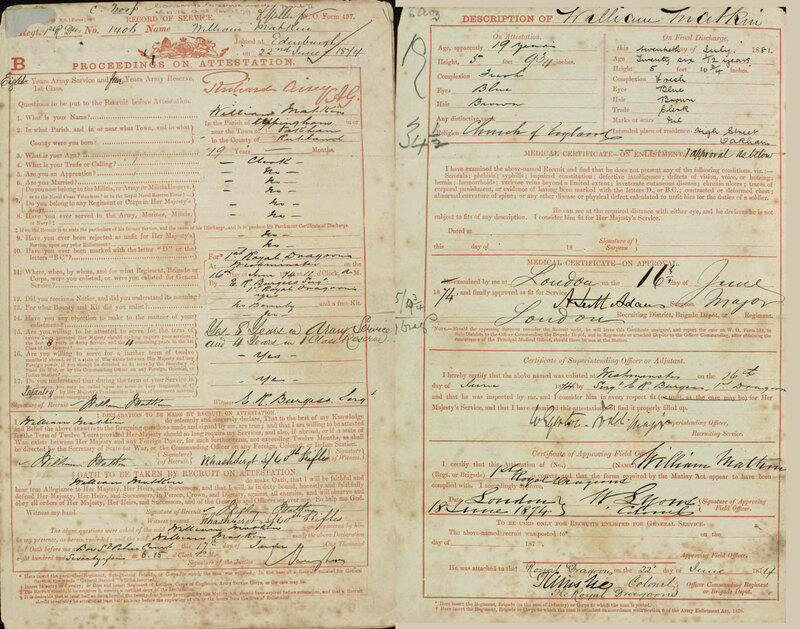 Her record on the passenger list notes that she was travelling 'to be married'. She arrived in Montreal on July 31st to be met by Frederick. The wedding duly took place on August 1st 1914 at St James Methodist Church, in the city. In due course the couple moved the 38 miles west to the township of Swift Current where their son Frederick Joseph was born in 1916. By 1922, the family had moved again, this time east to the Riverview district of Winnipeg. There, Frederick contributed a strong bass voice to the choir of the local Presbyterian Church. A second son, Charles William, was born in 1925. For several years towards the end of the decade Lucy suffered from ill health. She died on September 30th 1930 at Shellbrook, Saskatchewan. Frederick Joseph joined the 106 (RAF) Squadron of the Royal Canadian Air Force as an observer at the beginning of the Second World War. He achieved the rank of flight sergeant. He was killed in action over Germany on September 8th 1941. He is commemorated in grave 2C 15-18 at the War Cemetery in Kiel, Germany. In later life Frederick remarried, his new wife being Sylvia Scott. She had been born in the hamlet of Ohaton, Alberta, Canada in January 1904 although her family had emigrated from England. Frederick became manager of the Bank of Commerce of Canada a post from which he finally retired in 1945. The family moved to British Columbia the following year. They made their home at 2270 McNeill Avenue in the Oak Bay district of Victoria. For the last six years of his life, Frederick was troubled by increasing episodes of chest pain and disability. He died on January 17th 1962 from a coronary thrombosis. A cremation service was carried out at the Royal Oak Burial Park on the northern outskirts of Victoria three days later. Sylvia survived him by 15 years. She too was affected by heart problems and died in the Royal Jubilee Hospital, Victoria of a myocardial infarction on May 4th 1977. Robert Swift Matkin was born in Croydon on August 27th 1889. He travelled back to Rutland when the family returned to Oakham. In 1902 he was successful in obtaining a scholarship valued at £ 8 a year for three years to attend Oakham Grammar School (21). Upon leaving education he followed in the family tradition and he too became a clerk. As a young adult he moved out to Ireland, living first in the Strand Road, Pembroke East, Dublin and then in Tritonville Road in the Sandymount district of the city. He was of moderate height with black hair and bluish grey eyes. During the war years, he enlisted as a signaller with the Royal Naval Voluntary Reserve. He was stationed in Liverpool. After the war he returned to Ireland. In September 1917 he married Kathleen Edith Sims. They had two sons: Robert Geoffrey Swift Matkin, born on April 15th 1918, and Denis George Matkin born on February 27th 1921. Robert moved the family back to England during the 1920s. They lived for many years in Sweetcroft Lane, Uxbridge, Middlesex. Robert died in Christchurch, Hampshire in 1973. Kathleen died in Bromley, Kent in 1983. Son Robert was educated at St Helen's College, Uxbridge. He joined the Merchant Marine during the Second World War. In March 1943 he was third officer on board MV Silverbeech On March 13th 1943, it was in convoy RS-3 off the south east of the Canary Islands when it was torpedoed and sunk by U-boat U-159. The master and 58 other souls on board were killed. 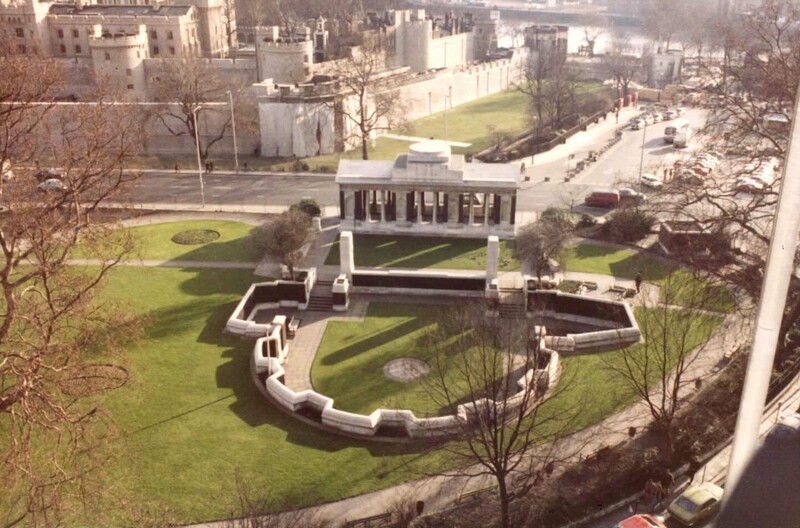 Robert is commemorated on Panel 97 of the Tower Hill Memorial, Trinity Square, London. Francis was the fifth of Joseph and Mary's sons, born in the autum of 1891 in Selhurst, Croydon. He moved with his parents back to Oakham by the turn of the century. He was still living in Penn Street at the time of the census of 1911 and was working as a draper's clerk. There is evidence that he made a voyage to Canada, presumably to visit his brothers, in 1912. During the First World War, he enlisted with the Army Service Corps on January 19th 1916 as a driver. His regimental number - T4/263283 - shows that he was assigned to the Fourth Army. This had been formed in France in February 1916 under the command of Sir Henry Rawlinson. The British Fourth Army were part of the engagement in the Somme Offensive between July 1st and November 18th 1916: a campaign in which more than one million men were killed or wounded. It is not known where Francis served but his record card shows that he was discharged from further Army service on December 29th 1916 because of sickness under paragraph 396 XVI of the King's Regulations. It is possible that he was caught up in one of the many devastating gas attacks that were used during the Somme Campaign. He was awarded the Silver War Badge in February 1917. 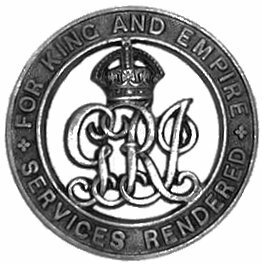 This badge was issued to officers and men who had been discharged or retired because of sickness or injury occurring through their war service. The badge was intended to be worn on the right lapel of civilian clothing. The youngest of Joseph and Mary's sons, Joseph Hugh Matkin, was born in Oakham on February 24th 1895. He was awarded a Junior Scholarship to Oakham School worth £ 10 a year in August 1906 rising later to £ 15. He emigrated to Canada in 1912. He joined the Bank of Commerce in Kindersley, Saskatchewan as a bank clerk under the guidance of his brother Frederick. He remained there for three years. At the outbreak of the first World War he signed on with the Canadian Overseas Expeditionary Force in December 1914. Now a young man of 19 years he was described as 5 feet 11 inches tall with a dark complexion, grey eyes and black hair. After military training in England he was shipped overseas to France where he earned the soubriquet 'one of three famous scouts: Messrs Bole, Jones and Matkin'. He was wounded in action in May 1916 and subsequently returned home to Canada in December 1916 aboard RMS Andania. He was discharged from Army service on November 18th 1918. Joseph initially set up home in Kindersley and took a job as an accountant for the Saskatchewan Wheat Pool, a grain handling and agri-food processing company based in Regina, Saskatchewan. He moved on to Regina in 1921. He met and married Kate Wallis, a girl from Darlington County Durham born in July 1894 who had emigrated to Canada with her family on board RMS Tunisian in 1912. He wrote extensive letters to his mother, the contents of which were later noted in an article 'Old Oakhamian in Canada' quoted in Grantham Journal Feb 8th 1936 Old Oakhamian in Canada. Joseph worked for the same company for 39 years, finally retiring in 1957. 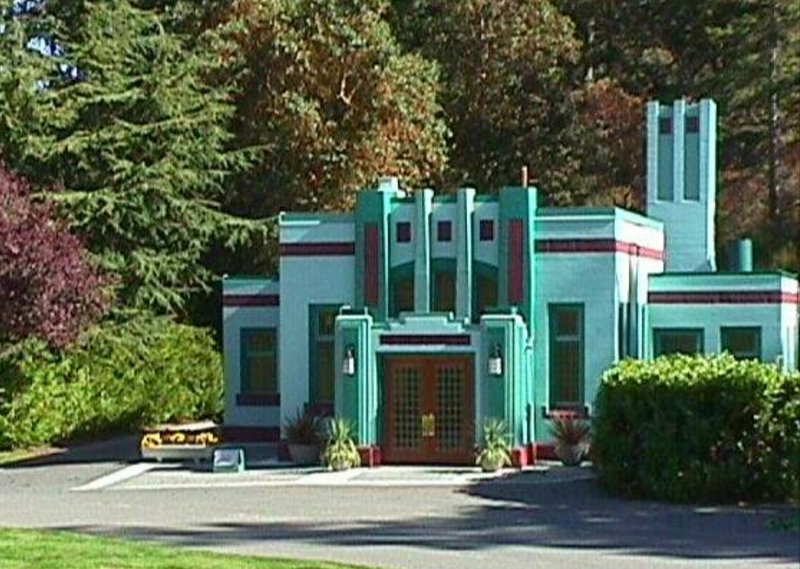 The following year Joseph and Kate moved to 1764 Oak Bay Avenue, Victoria British Columbia. There they stayed until his death on January 26th 1969. He had been suffering from chest pains and breathlessness for about a year. The final diagnosis was given as congestive heart failure. His cremation took place on January 29th 1969 at Royal Oak Crematorium. After the death of her husband, Kate's general and mental health slowly deteriorated. When she was unable to look after herself, she moved into the Sidney Personal Care Home, a facility in a village on the coast of the Saanich peninsula north of Victoria. She suffered a stroke and was transferred to the local hospital. She died there three days later on October 27th 1979. 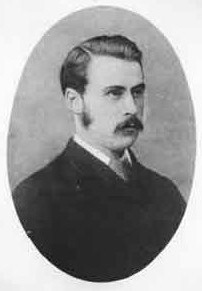 The fourth son of Charles and Sarah Matkin, William, was born in the summer of 1855 whilst the family were still living in Uppingham. 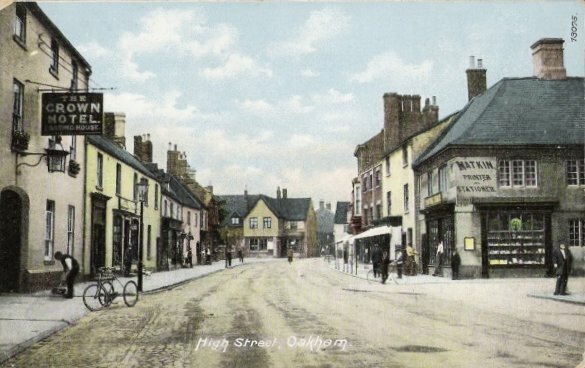 By the time of his sixth birthday, they had settled into the establishment in the High Street, Oakham. Little is known of his formative years although by his late teens he was working as a clerk. William joined the Army in June 1874 at the age of 19 years, but some months prior to this there is some evidence that he had been involved in a scandal. This is referred to in a letter that Joseph wrote to his mother from HMS Challenger on November 25th 1874. William was believed to be settled in March, Cambridgeshire on a contract for three years that year - perhaps in an apprenticeship - but then ran up large bills for clothes, "joining a 'Glee Club' and courting". Joseph had previously referred to William's 'choice in young Ladies' in a letter he wrote to his brother Charles in May 1873. William took his Oath of Attestation at Bow Street Police Court on June 17th 1874. He signed on to the 1st Regiment the Royal Dragoons for a period of eight years active service to be followed by a further four years in the First Class Reserve. At enlistment he was described as 5 feet 9¾ inches tall with a fresh complexion, blue eyes and brown hair. His first deployment was to Edinburgh. His service records show that he remained on home stations and did not proceed abroad. After two years, he became eligible for a Good Conduct medal and was promoted to the grade of Lance Corporal on July 10th 1876. As part of his duties he took courses and passed examinations in fencing and gymnastics. He was promoted to full corporal on January 13th 1878 and then to Special Fencing Instructor on August 20th 1879. 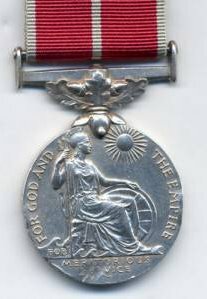 Eligibility for a second Good Conduct medal became available in June 1880 (although these were superceded by his in-service promotions). He finally left the Army on July 20th 1881 having served for seven years and twenty four days. The reason for his discharge was given as being "in consequence of being found unfit for further service". No medical cause was recorded. He was discharged in Dublin. William returned home to Oakham, living at his parents address. He was reliant financially on his army pension. His civilian life did not last for long and he was blighted by pulmonary tuberculosis. He died on February 28th 1883 at the age of 27 years. His death was recorded by William Swift, the brother of Joseph's wife Mary, who had taken over the role of Registrar of Births Marriages and Deaths for the District of Oakham from his father Thomas. 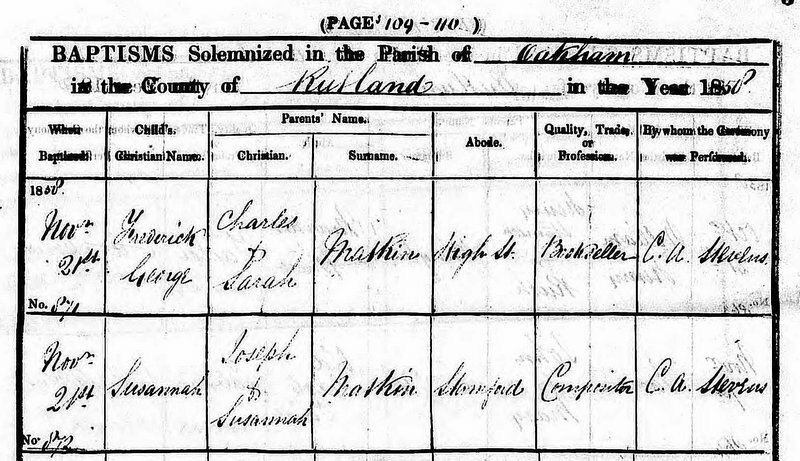 Last of Charles and Sarah Matkin's sons, Frederick George, was baptised in Oakham on November 21st 1858. Into his teenage years he attended Oakham School. Towards the end of the 1870s he travelled south to London to take up an apprenticeship with a drapery firm. The census of 1881 found him working and residing at Marshall and Snelgrove's Department Store along with another 250 draper's assistants and 50 draper's clerks. 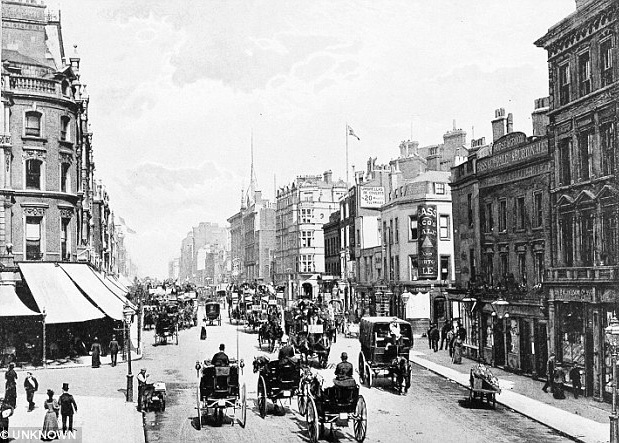 Variously described as 151-158 Oxford Street, 2-16 Marylebone Lane and Vere Street, the site is now occupied by Debenham's of Oxford Street. Frederick married Eva Reay, a girl from St Bees, Cumbria, at St Matthew's Church, Oakley Square, London on July 27th 1887. She was the youngest of the six children of chemist John Reay who had died in the spring of 1871. Initially they set up home at 3 Rochester Terrace in Camden Town. Frederick found a job as a carpet warehouseman. Eva became pregnat through the summer of 1889 and delivered a daughter on March 12th 1890. The baby was never well and in a private baptism ceremony conducted on April 27th 1890, they named her Eva. She died a few weeks later. The following year, Frederick and Eva moved around the corner to a four room apartment at 10, Wilmot Place. It is noted that at the same time, Eva's mother, Jane, was visiting Oakham and staying with Frederick's mother, Sarah. Frederick started tgrading as a house decorator and furnisher. A son they named Gerald Reay was born in the summer of 1893. Once again, Frederick moved his family, this time to a flat in Marlborough Mansions Hampstead. This was just a stone's throw away from Buckingham Mansions on Frognal Lane where Eva's sister Fanny Robinson Reay lived with her husband Walter Clark and family. This was also where Eva's mother would spend her remaining years until her death in 1915. Curiously from a family history perspective, Walter Clark worked as a wool broker and their eldest son took up employment as a raw wool valuer (shades of the occupational activities that were described in the first chapter of this series From Gretton to Barrowden 1: The Skin Trade)). By 1911, Frederick and Eva had moved again, three miles south to Delaware Mansions in Maida Vale but Frederick also maintained premises at 104 Wigmore Street in the Capital. The business appears to have run into financial difficulties and in July 1911 he filed for bankruptcy in the High Court of Justice (26). Frederick died in 1938, his death is registered in Willesden, North West London. Eva lived on through the years of the Second World War, surviving him by ten years. Her death is registered in Amersham, Buckinghamshire in 1949. In the meantime, their son, Gerald, had decided that his future lay elsewhere and he emigrated to Canada in the early 1900s. By 1916, he was living with his wife Dorothy in Macleod Alberta. She was born in Heath Hayes, Cannock, Staffordshire in July 1895 and had emigrated to Canada in 1908. They had two children, Genevieve and Vivian, and moved to Trail in British Columbia close to the border with the United States where Gerald worked as an engineer. In 1946, Gerald and Dorothy moved about 200 miles north east to Vernon, a city at the northern tip of Lake Okanagan. Dorothy had been suffering from ill health and chronic anaemia for the previous seven years. In the summer of 1947 she was diagnosed to be in heart failure and was admitted to Vernon Jubilee Hospital. She died there on November 24th 1947. She was interred at the Vernon City Cemetery three days later. For some time during the 1950s, Gerald had taken a job as a projector operator and had moved to the town of Penticton, which lies at the southern tip of Lake Okanagan. 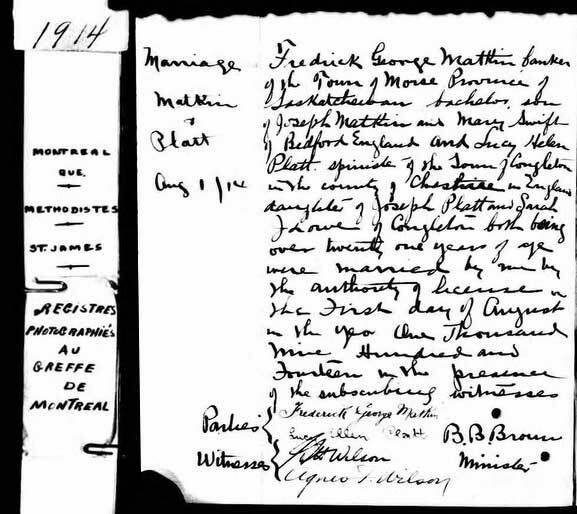 Gerald married again, his new wife was widow Maud Mountjoy King. She was born in Kensington, London on December 12th 1884 the daughter of labourer William Stidder. She had emigrated to Canada in June 1911. In the early 1960s, Gerald retired and they moved back north to Vernon, taking a house in 32nd Street. On April 9th 1968 Gerald collapsed with acute pain and shock. He was taken to the Vernon Jubilee Hospital where a ruptured aneurysm of the aorta was diagnosed. Nothing could be done for him and he died the same day. He was buried at the Pleasant Valley cemetery in the town. With increasing age and infirmity, Maud moved into the Mount View Rest Home in Kelowna, a town on the edge of the lake between Vernon and Penticton. She lived there until her 91st year. She suffered a stroke and was transferred to the Dellview Hospital in Vernon where she died on April 16th 1976. Vancouver island lies just off the southernmost part of the west coast of Canada, close to the border with the United States of America. Although its largest city, Vancouver, is directly opposite on the mainland, the capital of British Columbia, Victoria, sits at the southernmost tip of the island. It is the association with this small area of the world which helps to tie together the stories of three generations of Craxford descendants told in this and the previous article. Two of Joseph Matkin's sons had homes 3 minutes apart (Frederick George in McNeill Avenue, Oak Bay; Joseph Hugh in Oak Bay Avenue, Saanich) in Victoria. The final resting place of both is the Royal Oak Burial Park just 8 miles north. 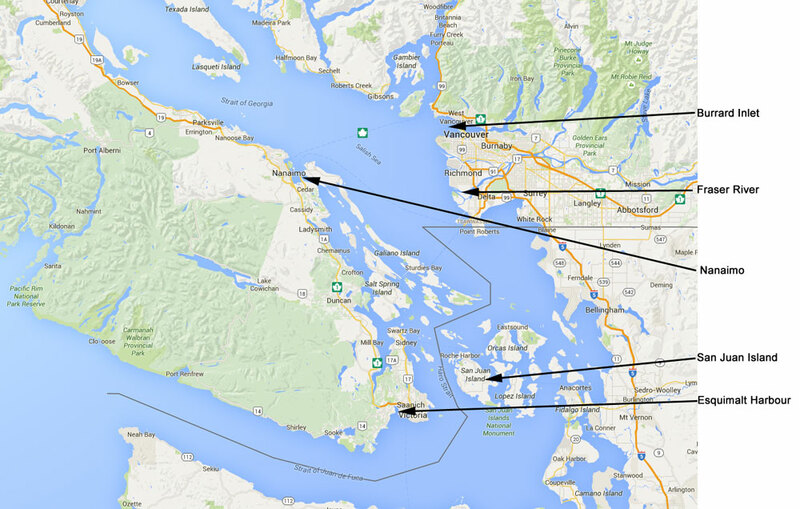 None of these places are more than 7 miles away from Esquimalt which was the harbour base for the surveying expedition on which Joseph Matkin's uncle, William Craxford served in the middle of the nineteenth century. Whether that association was by accident or design or is another example of the remarkable coincidences that the study of family history regularly uncovers cannot be known for certain. It is a well publicised fact that Joseph Matkin remained in constant and detailed contact with his own family. Although Joseph never visited the west coast of Canada (the Challenger Expedition was diverted south from Honolulu to Valparaiso) he makes several references to Vancouver Island in his letters. It does seem more probable than not therefore that the life experiences of one generation have trickled down to influence decisions and activities taken by the next and so on. [A]: "At Sea with the Scientifics" by Philip F. Rehbock (1992) University of Hawaii Press, Honolulu, Hawaii, USA ISBN: 0-8248-1424-X. 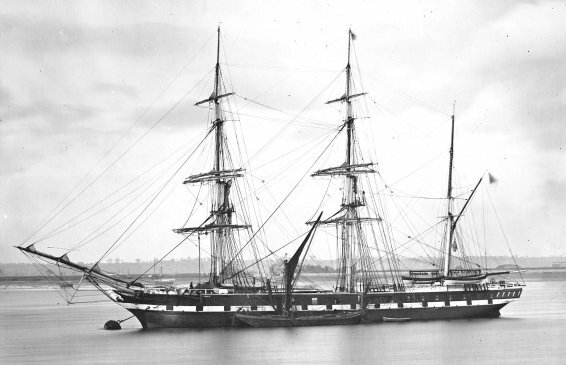 When HMS CHallenger sailed from Portsmouth in 1872, a young assistant ship's steward, Joseph Matkin, was among the crew. Throughout the voyage Matkin maintained a journal from which he composed many letters to his family back home. Personal accounts were published at the time by officers and scientists. Yet no account of the seamen's life "below decks" was known to exist until the early 1980's when two substantial collections of Matkin's letters surfaced. Matkin's granddaughter donated the letters to Scripps Institution of Oceanography in 1985 where they joined the letterbook of his cousin J.T. Swann in the Institution's archives. 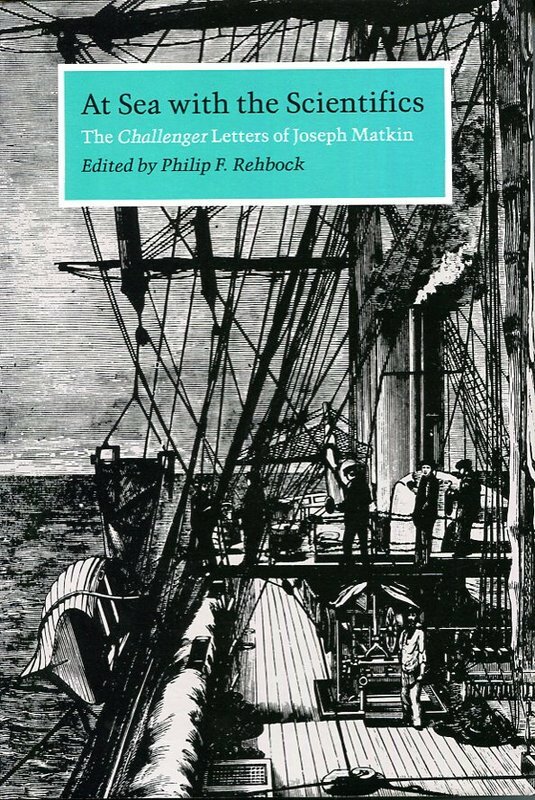 Philip F Rehbock has edited and annotated the letters providing a particularly readable work for anyone interested in oceanography and maritime social history. 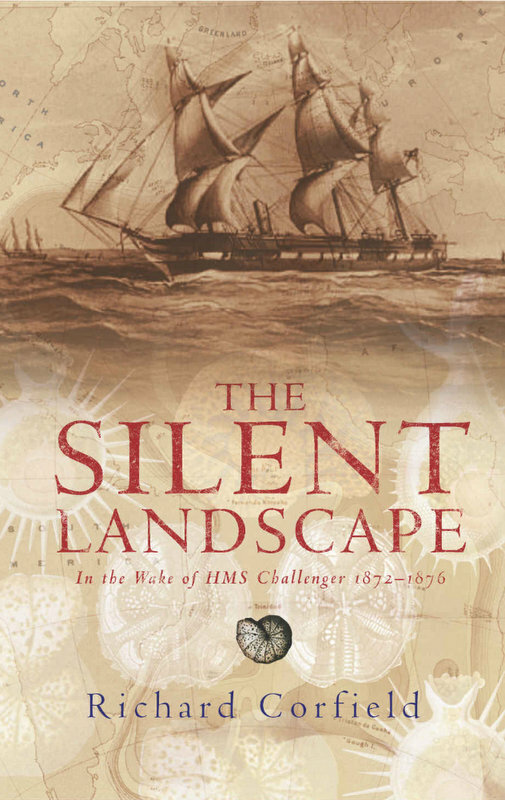 [B]: "The Silent Landscape: The Scientific Voyage of HMS Challenger" by Richard Corfield (2003), Joseph Henry Press, Washington DC, USA. ISBN: 0-309-08904-2. 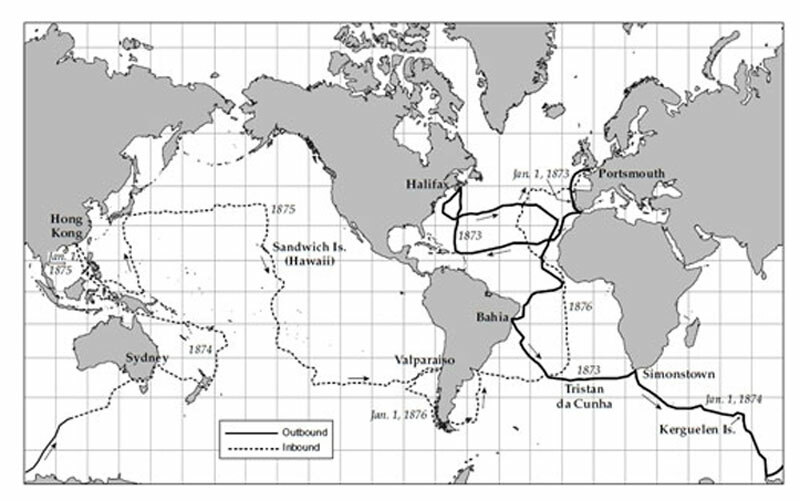 The Challenger Expedition lasted almost four years and traversed nearly 69,000 miles of ocean. It was a resounding success for Victorian scientists and explorers alike. The scientific report ran to 50 volumes, taking 20 years to complete and founded the sciences of oceanography and marine biology. The author has used the material from these volumes and from letters written by those on board, including Joseph Matkin, to tell the story of the Expedition and has skilfully projected what more the Expedition might have found had the scientists on board been equipped with present day knowledge, equipment and materials. The book is also available as a Kindle edition. [C]: HMS Challenger Project website. 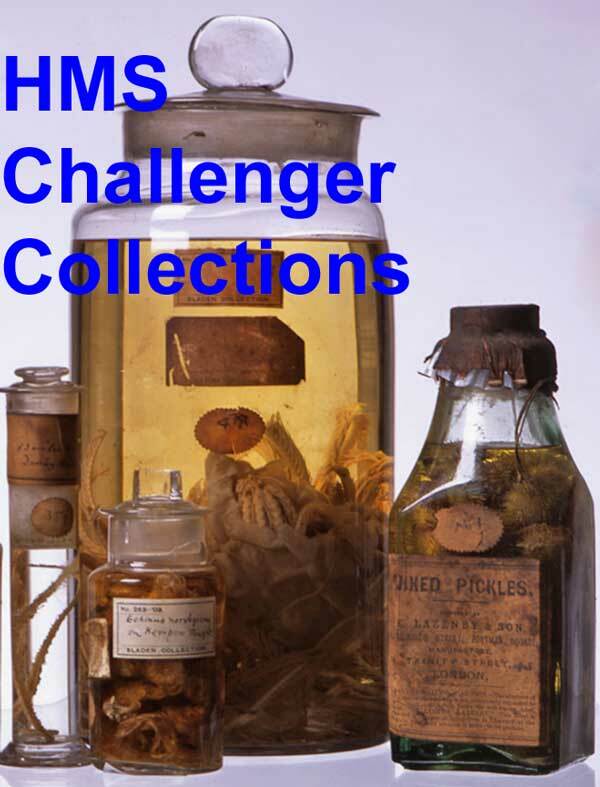 The Challenger Expedition collected thousands of samples of animals, plants, rocks and other objects from over 350 points around the globe. These were sent for identification to scientists around the world. Many museums such as the Natural History Museum hold large collections of these materials. However there are still many samples held in smaller institutions which remain largely unknown. The Royal Albert Memorial Museum (RAMM) is creating an online database and website to correlate and bring together Challenger material to make it freely accessible to a wide audience. 1 'Nettleham: To be sold by auction'. Sales by George Smith: Lincolnshire Chronicle October 25th 1950 The British Newspaper Archive; © The British Library Board. 2. Death Notice: Joseph Matkin: Stamford Mercury December 11th 1885 The British Newspaper Archive; © The British Library Board. 3. Notices of Disposal and Acquisition: Lincolnshire Chronicle December 21st 1855. The British Newspaper Archive; © The British Library Board. 4. Marriage Portions. Monthly Meeting of Trustees. Bedfordshire Times and Independent July 5th 1873. The British Newspaper Archive; © The British Library Board. 5. An American Appreciation; Grantham Journal October 7th 1899 The British Newspaper Archive; © The British Library Board. 7. 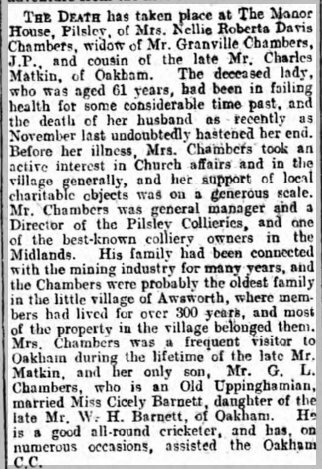 Death notice for Nellie Roberta Chambers: Grantham Journal January 16th 1926. The British Newspaper Archive; © The British Library Board. 9. Rutland Petty Sessions: Report. Leicestershire Mercury June 11th 1864. The British Newspaper Archive; © The British Library Board. 10. 'The Police' Letter to the Editor by C. Matkin Stamford Mercury June 17th 1864. The British Newspaper Archive; © The British Library Board. 11. Schools in Billesdon	British History Online. 15. Coming Home From Ascot: Report from the Lambeth Police Court The Morning Post June 22nd 1895 The British Newspaper Archive; © The British Library Board. 16. Occasional Notes: The Pall Mall Gazette June 22nd 1895 The British Newspaper Archive; © The British Library Board. 17. Defrauded the railway company: Oxted Petty Sessions. Kent & Sussex Courier January 21st 1921. The British Newspaper Archive; © The British Library Board. 21. 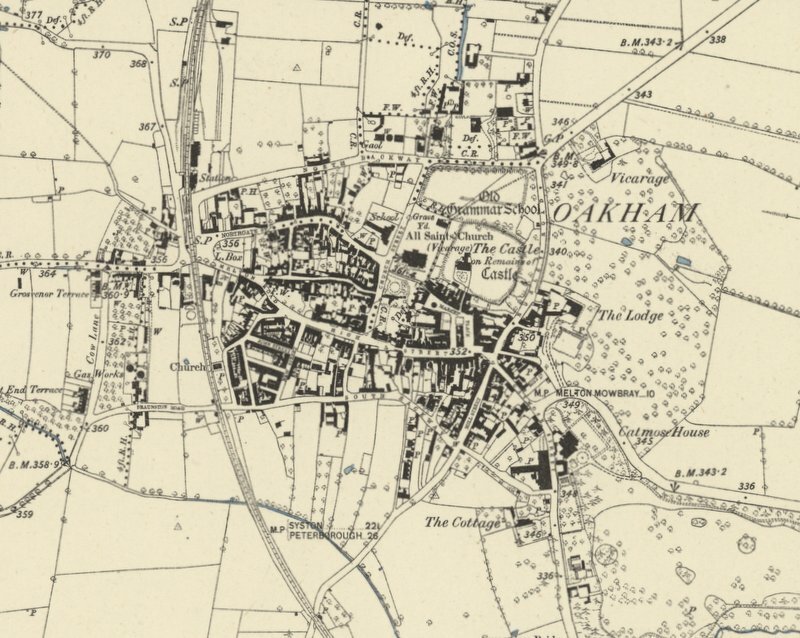 Scholastic: Oakham and Uppingham Journal in Grantham Journal August 8th 1902. The British Newspaper Archive; © The British Library Board. 24. The Late Mrs Matkin: Mother of Bunyan Meeting Secretary. Bedfordshire Times and Independent November 3rd 1939. The British Newspaper Archive; © The British Library Board. 26. Frederick Joseph Matkin. Adjudications at the High Court of Justice in Bankruptcy June 14th 1911. The London Gazette page 4558 June 16th 1911.